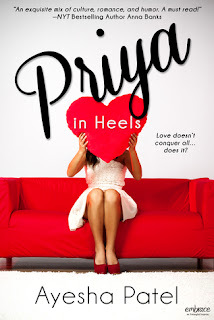 I've been skipping many New Adult titles recently because I've reached the limit of my tolerance for sameness and histrionic angst I've kept running into so when I saw Priya In Heels on Netgalley & read the blurb, I jumped at the chance to read something a bit different. I'm so glad I had the chance to read this. Priya was very engaging and I could relate to her. I did begin to find her putting off of her love for Tyler and underscoring how she'd only marry a man her parents approved, annoying but mostly because she seemed not to let Tyler go. It was a bit like she didn't want him for keeps but she didn't really want him to move on either. I said aloud many times, "Priya, you can't have it both ways!". I enjoyed how Priya's relationship with her parents was shown and how sometimes their perception of her or her of them didn't quite line up in fact. It was very believable that anticipation of reactions and expectations of family members are often out of line with what actually happens even when all parties involved love one another and everyone wants their way. I won't spoil but I did like that both Tyler and Manuk were good and charming men. I was hoping the story wouldn't go in the all too trodden direction where one or the other had to be made into a complete prat to make the choice obvious for Priya or the reader. Thank you, author. Really. While the romance is present in the story, I truly found the familya and friends bit to be the most poignant and engaging. For the final 10% of the story, I smiled, laughed and teared up with all that happened between Priya and her father and their trip to India. It was lovely and so very meaningful to me. I received a free copy of this title from Netgalley in exchange for my honest review. Many thanks.